Posted at: 7/21/2010 03:18:00 PM . 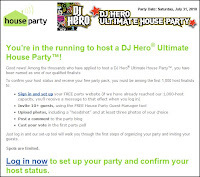 I have been selected to host my first party through HouseParty.com. This post will serve as the first of three relating to the experience. I will chronicle the hosting experience through the three posts, saving it as a draft between typing until I post it for you. 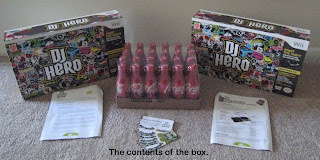 This way you do not have a ton of DJ Hero posts. 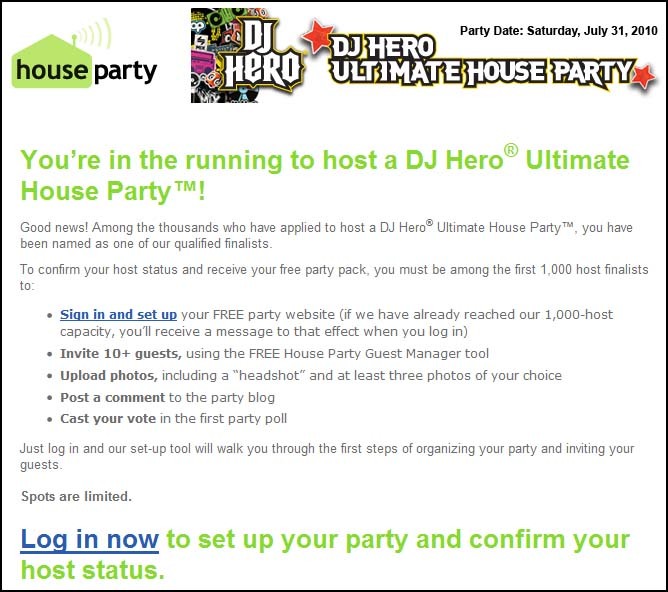 I applied for the DJ Hero party. The application asked questions such as what game systems I owned, how many people I planned to invite, and what I could do to make the party special. After clicking submit, I received an email with a confirmation link to finalize the application. I received an email saying that I was a finalist to host the event. Once you're a finalist, you must respond quickly to actually host the party. I'm not sure how many finalist emails they send out vs. how many hosts they will have however I tried to respond as quickly as possible when I read that. In fact, I responded from a computer in the Apple Store since I got the email on my phone while out shopping. While I'm not sure if that was really necessary, I didn't want to take the chance of missing out. After logging in and accepting the party, I received a second email saying that I was a host. It also explained that I should log-in and use HouseParty.com's party planning tools, including their e-vites. This part was actually kind of challenging for me because I realized I didn't know anyone's email addresses since I always communicate through text messages or Facebook. I also posted my party's URL on Facebook for my friends to RSVP that way. I received an email asking me to take a survey. The survey asked about my knowledge and opinion of DJ Hero prior to applying and my experience with the HouseParty.com website so far. I received an email letting me know my party pack has been mailed. I was under the impression that there would be a tracking number but that was not the case. 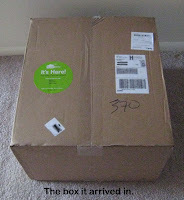 The email did say to contact them if the package did not arrive by July 28, 2010. Today I got an email from FedEx that a package was shipped along with the tracking number. The tracking number shows it was shipped today, and has an estimated delivery date of July 21, 2010. So that's it for the before the party events. The party is on July 31, 2010, so please look out for a during the party post to be posted on August 1, 2010. Once the party is over, I believe that there are more obligations to HouseParty.com such as completing a host's survey. My third post in this series will review the after party procedures so you know what to expect if you host a party. I am a host as well. Did you have any problems with your Wii turntables? I am having difficulty getting the scratch recognized on one. I sent houseparty an email and recieved a new turntable but got the same problem. Hoping you have any ideas that may help. I would hate to have the party with just one turntable. I haven't noticed any problems with it recognizing the scratching. 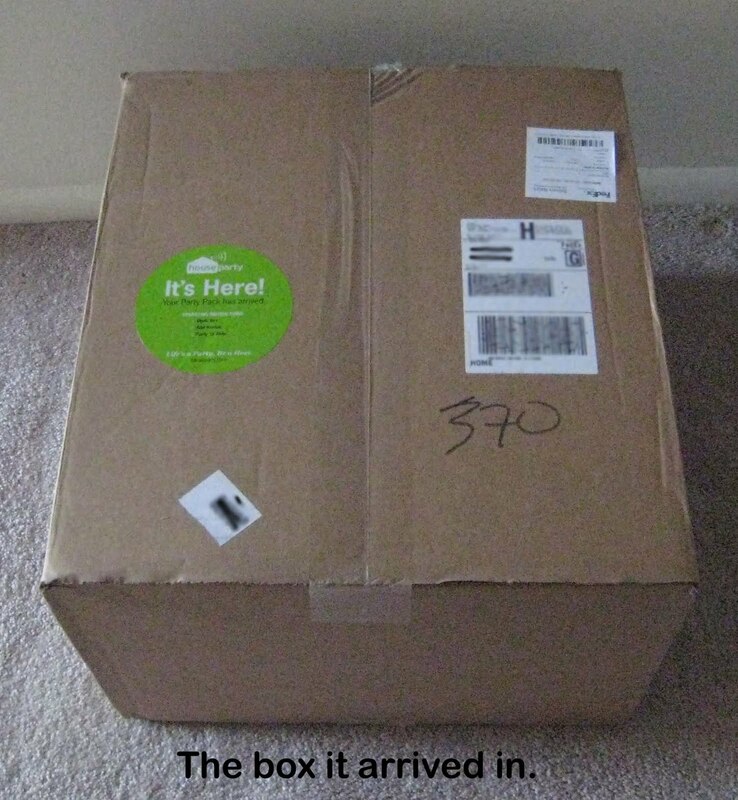 It's nice to know that they sent you a new turntable. Hope your party went well. My friends just left about ten minutes ago.